This Latin favorite arranged for easy combo features solid tutti scoring for young players. In addition there are brief solos written into all four parts. Includes: Blackbird, Can't Buy Me Love, And I Love Her, Lucy in the Sky with Diamonds. Swing classic from the Count Basie Orchestra. John Berry has done a nice job of adapting this swing favorite from the '40s to the combo format. 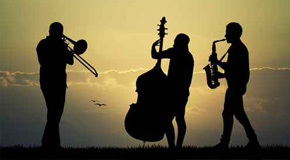 This medium up-tempo chart is great for ensemble playing and learning swing style.